Artist John Sloan is better known but his wife Dolly was a tireless campaigner for causes in the Village. 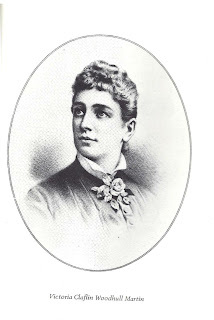 Sloan’s diaries are full of vignettes describing her buzzing off to demonstrations for the Socialist Party, the International Workers of the World (IWW), and Suffrage. He seems to be following her, and soaking up the atmosphere, more than out there professing his beliefs. However, Sloan supported votes for women and rights for workers, and drew illustrations for such left wing publications as The Call. 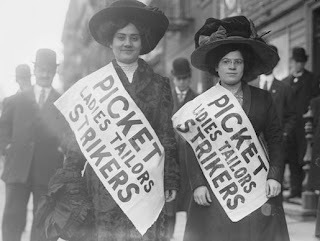 Dolly Sloan took these matters seriously and was very active in the Children’s Strike Committee during the Lawrence, Massachusetts textile mill strikes of 1912. 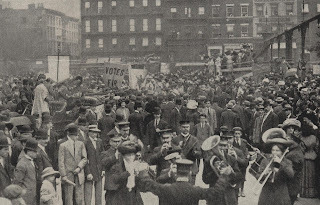 To help the Bread and Roses strikers, supporters, many from the Industrial Workers of the World party, took in the workers’ children, to free striking families to picket and to help with feeding the young ones. Dolly and John took in two children. The Sloans read widely in the press of the day and noticed how biased the coverage of labor demonstrations tended to be. In one diary entry, Sloan waxes satirical about a so-called &#8220anarchist riot&#8221 on May Day in 1912. 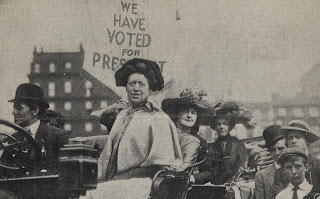 Photos: The 1910 Suffrage Demonstration in Union Square from the New York Times, May 29, 1910. Fascinating! I love John Sloan’s media critique — so similar to what activists found about the press covering demonstrations in the 1960s — a radicalizing moment for many. Wonderful portrait of suffragist and the context of her times.